I always wanted to use my macbook more effectively and do more tasks then I do right now. And I have found how to make it possible! 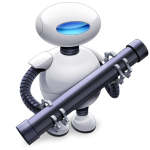 So, you can automate some routine tasks on your Mac with this program. Later I will publish some examples how to use it and make you more effective person.